Today's journey began in the Plains of Lucidity. Mysti sat on my shoulder, as usual, acting as my navigator. Mysti is my pet Psimouse, a three-eyed psychic creature who can detect the Nightmare Aura produced by bad dreams. I do not eat bad dreams, or gain power from them. I interfere with them to allow their victims to have a peaceful sleep. To them, I appear as a black-furred Bori in a large gray raincoat and hat, with black dress pants and shoes, gliding softly through their dreams. Mysti began to chirp loudly, her three eyes blinking rapidly. She pointed to the horizon, which was enveloped in thick gray smoke. The smoke represented the border between the Dream Plane and the limbo state of the Plains of Lucidity. "What do you sense, Mysti?" I asked her. Mysti spoke to me telepathically. A nightmare in the Dream Plane. Coordinates: 72-47-86, 99-41-33! To an outsider, those numbers may have seemed like nonsense. But to me, they meant where I would have to teleport to rescue this poor Neopet from their nightmare. I willed myself to transport to those coordinates. The world faded to red, and when it cleared, I was standing in a maze with deep blue, perfectly flat, very tall walls. I could hear crying from somewhere nearby. "No, please, no!" the voice pleaded. A huge, disembodied, green Mynci head floated in front of me, flying by without glancing at me. Its dead eyes had a glassy glaze over them, and its mouth was permanently fixed in a placid smile. I could detect a mortal's aura through several of these walls. Being a creature of the world of dreams, it was easy for me to phase through these walls to reach the source of the aura. I stepped out of the wall and came across the crouching figure of a little red Kougra, cowering in a corner. I stepped in front of the little Kougra, and as soon as he saw my back, he gasped. I turned to face him, and he gasped louder. "Do not be afraid, little one," I said calmly. When dealing with nightmare-afflicted Neopets, one must use caution to not yell or speak harshly. Tears streamed down the Kougra's face. Apparently, he did not see me as a benevolent figure. Perhaps it was the dark clothing, the blank eyes, and the lack of friendly facial features that scared him so. "I will not hurt you," I told him. "I am here to help you." I could hear a moan as the disembodied Mynci head came into view. It turned with a jerk, like an old arcade game character, and came floating down the hall as if on a track. "Good evening," I said calmly to the head. The head froze, its face still frozen in that calm smile. "The Grey Bori." "You must know about me, then," I told it. I heard the Kougra whisper, "Who is the Grey Bori?" "I am the Grey Bori, little one," I told him. "However, my name is Szarawe. The Grey Bori is merely a title." I turned back to the head. "Leave this Kougra alone, nightmare." The head still smiled at me. "Why should I do this? Children's dreams are so pliable. Such potential for nightmares such as I!" "Children do not deserve nightmares," I said, my normally calm voice with a bit of anger to it. "Children need innocence and love in their life, not fearsome beasts like you. Begone!" I thrust my hands out at the head, releasing a burst of dream energy. The invisible shockwave made the head dissolve into a mess of pixels. Within seconds, the head was gone. The maze's walls dissolved along with the head. Suddenly, both the Kougra and I were standing in a large green field. "Where are we?" the Kougra asked. "In a new dream," I told him. "I must leave you now. My work here is complete." I turned to him. "Maybe." With that, I teleported out of the dream. The field turned to red, and I was in a new location - the Geometric Plaza, a large field of squares and floating square boxes. Mysti had returned, sitting beside me. She leaped onto my shoulder. "Any other nightmares, Mysti?" I asked her. My work was done for that evening. I began in the Geometric Plaza, a land consisting of endless expanses of colorful tiles and the occasional floating box. Mysti, as usual, sat on my shoulder. She chirped loudly, indicating nightmare detection. "What is it this time, Mysti?" I asked her. Coordinates 24-25-87, 45-66-21, she said. I thought of those coordinates, teleporting to them instantly. I stood on a beach with nice white sand and a clear blue ocean. An odd location for a nightmare, I thought. I turned behind me, expecting to see a volcano erupting or something else nightmarish, but only saw a cute-looking little village of thatched huts. I detected no mortal aura in the village. I detected a mortal aura out in the ocean, however. I glided over the water's surface, searching for signs of mortality. I noticed a small figure thrashing in the water not far in front of me. I let out a small sigh. A drowning dream, of course. I approached the Neopet, seeing it was a blue Shoyru, and watched for a moment as she thrashed in the water, desperately trying to break the surface. I walked forward, bent down, and seized the Shoyru by the arms. She froze, and I lifted her from the water. Cradling her in my arms, I quickly glided back to the shore and deposited her on the sand. "What! What!" she asked. "No, who are you?" "I am Szarawe," I told her. "You need not fear me." "But who are you really?" "My true identity is only known in the world of dreams, kept in the mists and fogs and whispered only by the spirits that no mortal can understand." 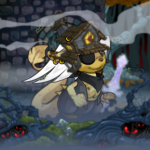 The Shoyru gave me a blank look. "My identity is beyond your grasp, young Shoyru," I said. "I'm a mega genius," the Shoyru stated. "Even geniuses like you could not understand who I truly am," I told her. "The world of dreams is one of the most bizarre that one can visit. You could walk it your entire lifetime and never understand anything that it gives you." "So what are you, then?" "A dream," I told her. "It is beyond your understanding." "I must leave now," I said quickly. "You are safe now, so you shall be at peace. This dream will fade, another will replace it, and I will be gone." "I must know who you are!" insisted the Shoyru, but I teleported away and found myself back in the Geometric Plaza. Mysti sat and stared up at me with her three eyes. I detected another while you were gone. Coordinates 98-05-65, 81-20-43. I imagined those coordinates, and the Geometric Plaza faded. I stood in a forest. The trees were all straight, towering pines with dark brown bark and green needles. The sky overhead was fading into sunset. It was quite beautiful, actually, had it not been crawling with nightmare energy. But where, I asked myself, was the victim? I detected their aura somewhere to my right and glided in that direction. The trees warped and twisted, and I detected stress that was warping the dream. This was typical when a Neopet was especially susceptible to dreams of this sort. I spotted a green Neopet - an Acara, it looked like - through the twisting and shifting trees. He was struggling against something I could not see. I made my way through the trees, phasing through them as if they were not there, and came to a rest in front of the Acara. He appeared to have sunk waist-deep into a pit of mud, and was struggling to free himself. The mud had been churned up around him, and his fur was sticky with it and covered with pine needles. His large eyes were moist with tears. "It is all right," I told him calmly. "I will help you." I offered him my hands. He hesitated, as if he feared my hands would burn, but gingerly placed his own paws in mine. I lifted him to solid ground and helped him stabilize. "What happened?" he asked me. "Am I dreaming?" "Of course you are," I told him. "If you were not, you would not be able to see me." "But... if this is a dream, why is it so real?" "I could actually feel everything," he said. "How cold the mud was, how the air smelled like pine needles, your hands on my own lifting me free..."
"Dreams can be like that," I told him. "Your mind easily plays tricks on you." The landscape dissolved, replaced with a Terror Mountain landscape. "A new dream," I told him. I assumed that the nightmares would die with the transition, but I still smelled the nightmare energy in the air. "But something tells me that this is a nightmare as well." The Acara stood close to me, clutching my hand tightly. I saw him look up at me in fear. "Will I be OK?" he asked. "As long as you are with me, you will be safe," I said. I heard a loud, thunderous boom, and I looked down to see that we were standing on a field of ice. The ice was shattering, causing great fissures and splitting open to reveal black water beneath. In a swift movement, I had lifted the Acara into my arms. He wrapped his arms around my neck as I rose into the air, gliding away from the breaking ice. "Do not look down," I ordered the Acara. He nodded meekly as I tried to find a safer location in this icy landscape. I spotted the lights of what looked like Happy Valley beneath us, so I descended and glided into the town. I should have known that the breaking ice was only the first stage of this nightmare. The first Neopet we encountered was a green Bruce with a leering, deformed face. His eyes were below his beak, which was in the middle of his forehead and sprouting terrible, needle-like teeth. "Begone!" I told him. "You will not torment this child!" "But little Timothy's dreams are so fun," the nightmare told me. I recognized the echoing voice of a Recurring Nightmare. Apparently, this was not the first time little Timothy had this nightmare in his dream. "His mind is troubled, and it is a great feast for nightmares like us." "What do you mean, his mind is troubled?" I asked it. "Oh, little Timothy doesn't do so well in the real world," the nightmare said. "His parents are always angry at him, he gets bad grades in school, he's always thinking he does things wrong. Troubled minds produce much of a feast for us." I looked at little Timothy's frightened face. 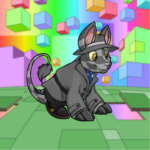 This poor Neopet's only refuge from the troubles of his real life was his dreams. But his cursed troubles produced a beacon for the nightmares to come and invade them. "If you do not leave," I warned the nightmare, "I will have to rip you apart with my hands." The nightmare's forehead beak twisted into a cruel grin. "You wouldn't murder a fellow dream, would you, Szarawe?" So this one knew my name. This was not unheard of in the world of dreams. I had a sort of reputation among the nightmares as a murderer of their kind and a destroyer of their food supply. But I had to do what must be done to rescue these children from their own minds. "I would do it gladly," I growled, "especially if the fellow dream was not a protector like I was - but a destroyer, a malefactor who delights in such torment as this. Now, BEGONE!" The shout blasted the nightmare with a blast of dream energy, and he dissolved into pixels. But his dissolving triggered his brethren's awakening. From the houses came more deformed Neopets - a blue Aisha with a single eye on its stomach and no face, a blue Draik with a foot where its head should have gone, and other unspeakably horrible nightmares. "Leave this Neopet alone!" I roared at them. My order fell on deaf ears, and the nightmares advanced. Some were limping as if their legs had broken, others glided, some simply appeared closer without moving. "Szarawe, help!" cried Timothy, tears streaming down his face and sobs spitting from his throat. "You will be safe," I told him. I looked up at the nightmares, rage burning in my eyes. "Szarawe has come to stop us?" taunted a nightmarish yellow Chia with no arms. "What can he do against a swarm?" laughed a nightmarish pink Flotsam with three extra horns and no eyes. I willed the benevolent dream energy to come to me, to protect Timothy and I from these beasts. Whitish mist swirled up around us like a cyclone, making a shield that would forbid these monsters from coming any closer. I focused on the benevolent dream energy that remained in Timothy's mind. The snow turned into a white misty soup, and the nightmares began to scream most terribly. They sank into the mist, dissolving as it swallowed them. When the mist covered the entire landscape and the nightmares were gone, I willed the benevolent dream energy to dissipate. I could not change the dream entirely just yet - my powers did not extend that far. "You saved me..." Timothy gasped. "Will those nightmares ever bother me again?" "If they do, I will do more than make the dream mist swallow them," I said. The landscape changed into a pleasant land of candy - sweet pink bubblegum ground, fluffy white cotton candy clouds, a powder-blue sky, lollipop trees, and rock candy mountains in the distance. This would be all right for Timothy, I thought. I set him on the ground and patted his head. "Sweet dreams, Timothy," I said to him. "Farewell." The last I saw of the Acara was his wide eyes looking up at me as I faded back to the Geometric Plaza. I began in the Village of Slumber, a ghost-town-looking village of neat little brick buildings and the occasional statue or fountain that did not flow. Mysti sat on my shoulder, sniffing for nightmare energy. She had detected nothing yet. I glided silently through the empty streets. A Figment, a basic dream figure, on its way to a dream walked in front of me. This one had taken the form of Aethia the Battle Faerie, as if she was drawn by a five-year-old. "Good dreamday," I said politely. She did not acknowledge me as she glided past. I should have known that Figments are not one for conversation until they arrive in a dream. As I glided along, the shadows began to shift and change. Mysti did not stir. One of them rose from the ground and floated in front of me. "What is it?" I asked it. The shadow took the vague shape of Timothy - the green Acara that I had rescued the day before. His shadow self smiled at me. "Szarawe... I don't know if I'll ever dream about you again..." he said, "but... thank you. I've never slept better." I smiled at the shadow. I reached out and held the shadowy Acara's hand. "Only if you have another nightmare," I told him. "But I pledge my word that I will come to save you, and the nightmares will bother you no more." The shadowy Acara seemed confused, looking down at my hand. Then, the shadow shifted into its normal blob shape again. I continued on my way, the faint light of the Village of Slumber's sun glowing in the distance. Mysti had fallen asleep on my shoulder, giving up on searching for nightmare energy. Nothing else to report for this dreamdate.